Oklahoma's state capitol dome was added some 88 years after the capitol was built, finally completed in 2002. But not far away is another dome that has been turning heads since 1956. 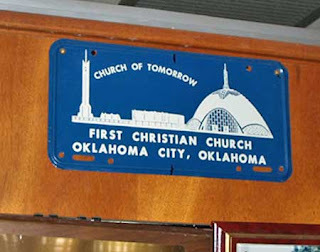 It's the First Christian Church of Oklahoma City. Call it a wigwam, igloo, earthbound spaceship or dome- no matter how you describe the shape of the sanctuary, it's definitely eye-catching. The thin-shell concrete dome is massive, with seating for 1200. Connected to the dome is a four-story administrative building and a 185-seat theater. Dedicated as "The First Christian Church of Tomorrow," the architecture caught the attention of local newspapers, as well as Life magazine (Feb. 1957). Last summer I had a unique opportunity to explore these interesting buildings. The main complex was designed by R. Duane Conner in 1953. Conner was a member of the congregation and offered three different designs for the church. Credit is also attributed to his partner, Fred Pojezny. The footprint of all three buildings in the church complex are round. The largest, and most renowned, is the main sanctuary. Connected by a small stairwell/atrium made of glass and sandstone is the Educational Building. Behind that is the Jewel Box Theater which offers theater-in-the-round. Finally, behind all this is the striking carillon spire, that has doubled as a cell tower since the Nineties. At first glance the two smaller structures seem in contrast to the organic lines of the dome-shaped sanctuary. The center Educational Building has very angular metal awnings that give it a more Euro-industrial look. The little theater is also an angular structure. On my first visit I assumed these two buildings were additions, but was assured they were original. Later research uncovered one possible explanation for this melange. This aerial view was found in a church history published in the Eighties and appeared in the Daily Oklahoman. Note the location of the reflection pool- now a playground.Browsing through the church archives I found several items of interest. One was a promotional piece published shortly after the congregation approved the building's design. The design they approved was the second offering from Connor, and renderings appear in this promotional brochure. But the tower and sanctuary design we see today are quite different, much more angular than the third variation that was eventually built. In addition to the main church complex, there are two outlying buildings. One is a youth center and the other is dedicated to the operations of the Oklahoma Interfaith Alliance. Any one of these structures is a treat of Mid-Century Modern architecture; taken together it verges on a hipster Disneyland. All of these unique structures are at the center of what originally spread across 40 acres in an area known as "Edgemere." The church purchased the property in 1946 when the city decided to move the municipal golf course. A year later a 3500-seat amphitheater was dedicated, and evening services were held "under the stars." It would be almost a decade before the church we see today was built. Thanks to Lynne Rostochil for providing the photos and scans you'll find at the above links. This material was more than helpful in writing this article. Lynne snaps some wonderful architectural photographs, and also happens to be R. Duane Conner's granddaughter! I appreciate seeing the church highlighted. Seeing the church complex last year was a wonderful memory as I had not been back to OK in years. It brought back the wonderful memories of Uncle Fred. As I understand, this commission and much of its function even into its later years should be given to Fred Pojezny as a member of this congregation for his entire life, he was dutiful in providing services not only in design but repairing, maintaining, and training others on many of the futuristic elements of this complex. Rev. T. J. Head was my great grandfather. I had the privelege of visiting your beautiful church back in 1976. The very kind people gave me a blue book on the history of the church and conducted a tour for me. I have never forgotten this visit and how much it meant to me to see what my great grandfather began. God Bless You.